We are building an autonomous mobility cloud. With a range of different vehicles in the fleet we will be able to suit every transportation need and cater to different distances as well. Our French beauty Arma produced by Navya is the obvious choice for taking passengers the first and last mile between public transport and their destination. It can solve a variety of mobility tasks in municipalities. This model is functionally in operation in Sion, Gothenburg, Detroit, Lyon and Las Vegas. // Max speed 45 km/h. // 2400 kg, L: 475 cm, H: 265 cm; B: 211 cm. // 11 seated passengers, 4 standing passengers. // App. 100 km (8 hours) when fully charged. // Turns on both sets of wheels. // No difference driving forwards and backwards. 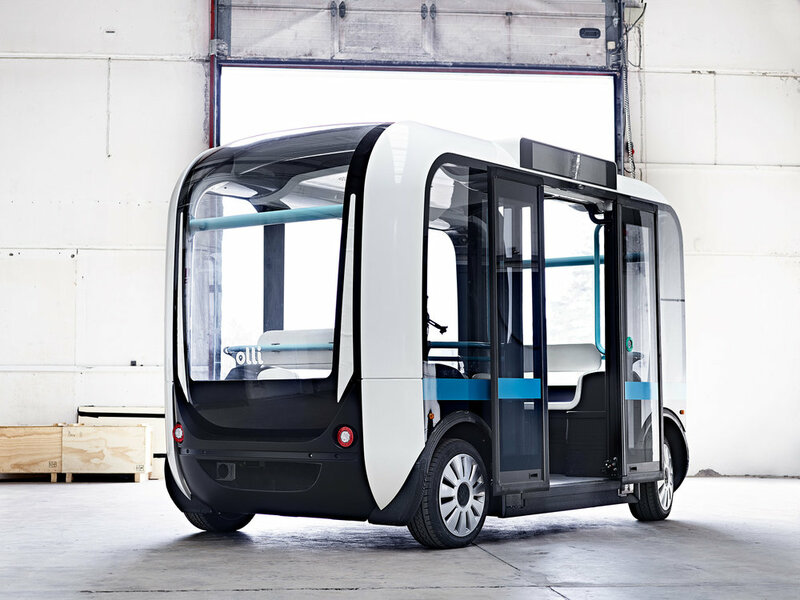 Olli was the first self-driving shuttle in our fleet. The shuttle is produced by US-based Local Motors. The innovative design is the result of crowdbased co-creation, and it is partially 3D printed. Passengers may interact with the cognitive system via IBM Watson integration. // Max speed 40 km/h. // 1840 kg, L: 392 cm, H: 250 cm, B: 205 cm. // App. 8 hours of driving when fully charged. // Built with modules and partially 3D printed.